PanARMENIAN.Net - Arshile Gorky (1904-48) made groundbreaking paintings in the mid-1940s before he took his own life. 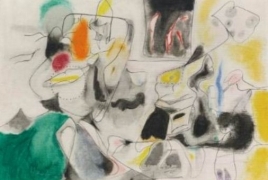 'Ardent Nature: Arshile Gorky Landscapes, 1943-47', on show at Hauser & Wirth (the first Manhattan show since the Gorky estate left Gagosian), could well be in a museum, The Art Newspaper says in an article about the artist, an Armenian Genocide survivor. Those years were a period of discovery for the painter, amid broader discoveries that transformed art as we know it. As Gorky put it, “abstract art enables the artist to perceive beyond the tangible, to extract the infinite out of the finite.” What you see in more than 30 works on show is an artist imagining and entering into a world of abstraction, grounded in observations of the natural world, based in part on repeated visits to Virginia. If abstraction is a spectrum between representation and pure form (with purity as relative a term as landscape), we can see Gorky balancing both ends of that range. Scent of Apricots on the Fields (1944) has the geometry of a mosaic and a palette of soft pinks, reds and oranges that evokes the Caucasus. Paint dripped down from the top of the frame creates the feel of an awning. It wasn’t just Pollock who was dripping. In the monochrome painting The Opaque (1947), dripping that gives the effect of travertine marble is one of multiple textures in a sea of forms filled with eye and window shapes. Think of an oblique homage to Miro. Lush green leaves in Apple Orchard (1943-46) elbow their way upward and outward. Gorky was born Vosdanig Manoog Adoian in 1904, in Khorkom, outside the eastern Anatolian city of Van. By 1915, Turkey’s new military leaders launched a campaign to deport and murder Armenians. Gorky and his family escaped the worst brutality of the Armenian Genocide. They endured starvation and homelessness instead of mass extermination. The young boy left his family behind for the US, then fled relatives in Boston for New York. The New World was a place of reinvention—a name, a history, an approach to art. Not that Gorky left his memories behind. Some of his paintings (and the energised pencil studies for them) seem more like recollections of childhood places than lush valleys in Virginia. There is so much by Gorky to see from the 1940s, when he stepped outside the shadow of Picasso and others and moved into a hybrid abstraction of his own. Yet within that style, the influences of his peers are still evident: from Picasso to Miro to Duchamp and even Chagall. His journey, before its tragic end, was to take them along while becoming himself. 'Ardent Nature: Arshile Gorky Landscapes' 1943-47 will be on show at Hauser & Wirth, New York, until December 23.